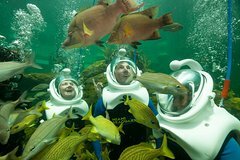 Discover the underwater world on this helmet-diving experience at the Miami Seaquarium. Put on a dive helmet and immerse yourself in a 300,000-gallon (1.13-million liter) tank to explore an amazing tropical reef. With the dive helmet, breathe freely underwater as you spot tropical fish and stingrays and watch the divers feed the marine animals. You’ll also enjoy same-day admission to the Miami Seaquarium’s fascinating shows and exhibits. Embark on an underwater journey through a 300,000-gallon (1.13-million liter) reef tank at the Miami Seaquarium! Wearing your state-of-the-art dive helmet, which allows you to breathe freely and easily, walk along the bottom of the tank to explore life among the reef. During your 20-minute journey, you’ll discover unique experiences around every corner. Encounter tropical fish, stingrays and a variety of other sea creatures. Become immersed in the tropical reef as the divers feed schools of fish and majestic rays. In addition to your reef trek, you’ll also enjoy a full day of shows and exhibits at the Miami Seaquarium.